In a word, Vienna is awesome. Not in the way that everything seems to be “awesome” these days, so much so that is has lost its meaning. Vienna is awesome in the truest sense of the word – inducing awe and inspiring an overwhelming feeling of reverence and admiration. But while Vienna and Salzburg both have much to offer, a scenic road trip across Austria’s countryside will give you a more delightful overview of the country. Rolling hills, majestic mountain ranges, sparkling lakes, and storybook towns await in this amazing road trip itinerary from Vienna to Salzburg! For nine consecutive years now, Vienna has been crowned the world’s best city to live in. Surely, you would think, that endorsement would have been enough to draw the tourist crowds in? But surprisingly, Vienna remains one of Europe’s underrated tourist destinations. While it does enjoy the constant stream of culture- and art-lovers finding their way to the historic capital’s cobbled streets and famed opera houses, there’s much, much more to Vienna that largely remains under the radar. We started our drive from Vienna at 10 AM, and since then it has been one amazing scene after another. We gawked at Vienna’s grand buildings, at the countryside that looked like Tina Blau’s oil paintings come to life, the roads so smooth and well-maintained, and at the BMWs and Audis zipping past us as we drove our rented Seat within the 130 KPH limit. Little did we know, the best view was yet to come. After brief stops at several points in Lower Austria and Wachau Valley, we entered Salzkammergut and began our mountain drive. It was like entering a dreamland – we passed through serene villages complete with cows grazing contentedly on emerald pastures, which turned into narrow mountain roads overlooking a glistening lake. Less than half an hour in, we caught the first glimpse of our day’s final destination. 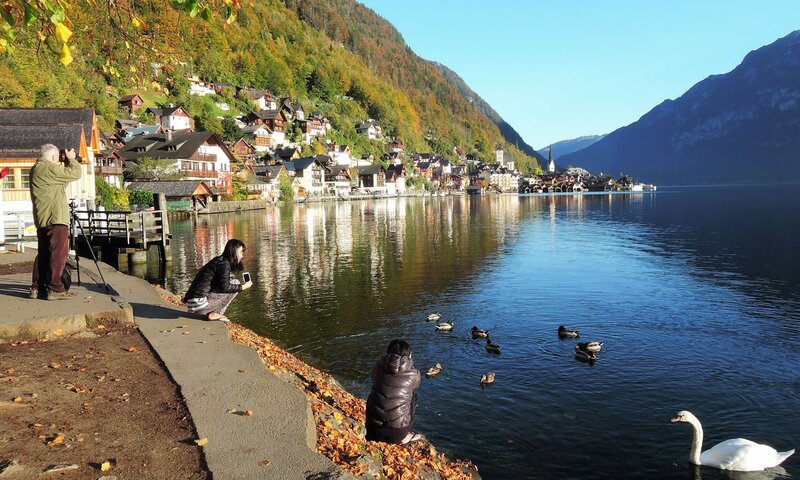 As we rounded a curve, the trees parted on one side of the road, and there it was, hundreds of meters below us – Hallstatt lying snugly between the imposing mountains and the serene lake. As the sun set, we finally rolled in to our pension. The next few days we would explore Hallstatt and Salzkammergut, which became one of the most relaxing holidays and a welcome break from Central Europe’s busy cities. It’s almost difficult to tear yourself away from Austria’s magnificent cities. You can spend days roaming around Vienna’s architectural wonders, marveling at Schonbrunn and the Gloriette, getting lost in mazes of manicured gardens and abundant artwork. There’s much to see and do in Vienna and Salzburg, and indeed, visiting these cities is a great way to discover Austria’s glorious history and culture. But to get to the heart of Austria’s rustic charm, you must venture to its small countryside villages. You’ll find that there’s more to Austria than operas and schnitzels and all-out opulence. There are also stunning natural landscapes, breathtaking vistas, picture-perfect storybook towns, and plenty of outdoor adventures to be had. If you only make it to one town, make it Hallstatt. Nestled in Salzkammergut’s mountainous region, Hallstatt is a narrow town sandwiched between a mountain and a lake, lined with pastel houses decked with flowerboxes, and with swans gracefully plying the coastline, making it the perfect storybook town to take a break from the cities. It’s a great stopover on a drive from Vienna to Salzburg, and a great base for exploring the rest of the gorgeous Salzkammergut. If you’re thinking of venturing to Salzkammergut soon, here are our best recommendations on where to stay in Hallstatt.